We hope you are well and had a great weekend. This week we have a deal perfect for students heading back to Uni. 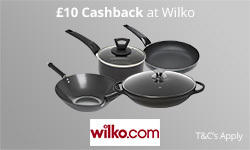 We're offering £10 cashback on a £10+ spend at Wilkos for new TopCashback members. The offer isn’t only limited to students’ stuff though; it includes absolutely everything on the Wilkos site! As always, it would be awesome if you could promote us. Please see below for more details. All new members have to do to claim £10 Cashback at Wilko is follow these four easy steps! New members click 'Get Cashback Now' to go through to Wilkos website and shop as they normally would. New members can get equipped for university knowing they'll be recieving up to £10 Cashback.